Home / Pain Management / What Is The Best Heating Pad: For Back / Neck / Shoulder Pain? The use of heat therapy as pain relief dates back to 500BC when the ancient Greeks and Egyptians used the sun to help treat illnesses. Applying heat to your tissues increases your blood flow and causes your connective tissue to become more flexible. A thermal bath each day isn’t really practical (sadly! ), however luckily there are plenty of readily available heat pad products that you can enjoy in your own home. We’ve taken a look at the market and handpicked a selection of some of the best heat pads available today. Who Benefits from Heat Therapy? Before using any type of heat pad, you should always read the instruction manual. If you are unsure of its suitability it’s best to speak to a medical professional to ensure it is appropriate for your health or medical conditions. Extra large pad with digital LCD controller and 6 different heat settings. Portable foldable 12″ x 24″ heat surface! Designed to mould to the contours of your neck. Extra tall collar for targeting neck pain. Amesthyst stones deliver deep natural penetrating heat as far as 8 inches below the skin. The 18 layers of this Far Infrared Amethyst Mini Mat make it feel like a high quality item. The gemstones within it are 100% natural Amethyst crystals from Brazil. The stones absorb the heat releasing negative ions, which have been shown to help with stress and depression. Amethyst stones are also able to deliver deep penetrating heat, as much as 8 inches deep below the skin for a more satisfying heat experience. In terms of safety it comes with an overheat function and controller so you can get comfortable and relax without worrying about settings and timings. We love the fact that the mat comes with a waterproof cover and carry bag, allowing you to use it at home as well as at a yoga studio or even in the workplace. It really does look great too, with a soft suede covering and exposed centre so you can see the beautiful crystals beneath. Those with lower back pain, as well as those being treated for Lyme disease, felt it did relieve their pain. If you’re considering the Healthyline’s Rainbow Chakras mat but don’t have the money to spend then the Amethyst Mini Mat could be a great alternative. When you need a heat pad that can travel with you then the PureRelief XL offers an extra-large 12″ x 24″ heat surface that can be folded easily in to a convenient storage bag, so you can treat sore muscles in your back, abdomen and shoulders whilst on holiday or simply away from home. It has 6 temperature settings and a thick cover, both of which make it a popular, affordable option for daily use too, a good alternative to some of slightly pricier options. Users have commented that the heat pad doesn’t retain its heat, however if you’re looking for something that you can pack away quickly and easily then this can be a benefit. Also when compared to other heat pads, the design and stylish color make it a good option if you’re looking for something a little more contemporary and discreet. If you’re suffering from pain throughout your whole body then you might want to consider the Healthyline 6-in-1 Therapy Healing Mat. This luxurious rainbow chakras healing mat is encrusted with gemstones including Carmelian, Red Jasper and Amethyst. The mat is designed to help cleanse your chakra points and be used in chakra yoga practice and meditation. The mat has a whole range of different features including a PEMF therapy system, which sends repeated electromagnetic pulses towards cells that might have been injured or damaged. It is a therapy recommended in the chiropractic community and has been shown to have a positive impact on post surgical pain. Additional features include hot stone therapy and deep penetrating far infrared rays. Those reviewing the product responded well to the heat function and reported improved sleep as well as relief from pain. Healthyline are committed to making sure you get the most from your mat and one reviewer who had sought advice gave great feedback about their customer service. 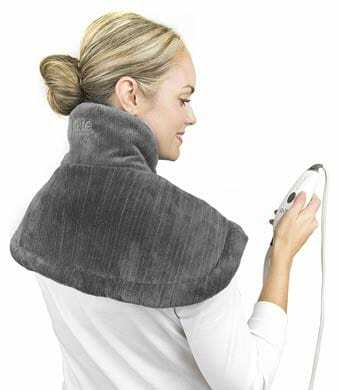 For those looking for a neck and shoulder pad that covers the entire neck take a look at the Renue Contouring Neck and Shoulder Heating Pad from Sunbeam. The design of the wrap has been done in such a way that it moulds to the contours of your neck. The heating pad has a tall collar too to really bring comfort and relief to those suffering from neck pain. The weight of the wrap, most notably around the edges, and magnetic fastening means it fits more comfortably than other wraps. In terms of control you have the option of four different heat levels, controlled with a simple unit on a 9ft cord. Plus the soft Micromink fabric is easy to wash, simply pop it in the washing machine and off you go! The neck and shoulder wrap comes with a 5 year limited warranty so you also get great coverage in case of any problems. Some users did report a smell from the product, however overwhelming feedback is positive. Users reported using the wrap every day for relief from pain with wonderful results, with one user calling it the ‘Cadillac’ of heating pads! The flexibility in size also appealed to those with smaller or larger necks. 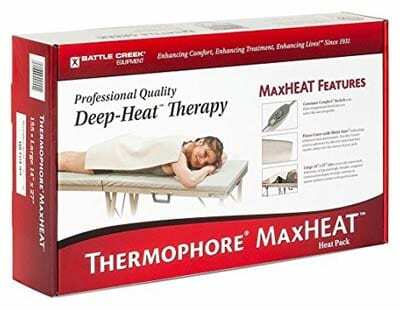 We’re impressed with the Thermophore MaxHeat Deep-Heat Therapy heat pad due to the size, 14″ x 27″. It’s the largest size that Thermophore do and is big enough to cover the entire spine, not just one small, isolated area. Previous models have required you to hold the switch down in order to the get the pad to heat, however this version has a “set and forget” feature, allowing you to switch on the heat and then sit back and relax. Some reviewers commented that the pad can get too hot, however for others it provided the exactly the level of heat that they were looking for, a level that other pads can’t provide. Those suffering from arthritis favoured this pad over others due to the size and its ability to offer relief across a number of different areas. 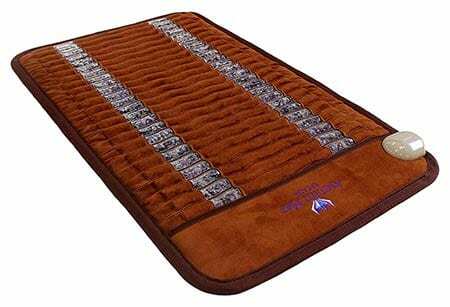 Also for deeper heat penetration, the Thermophore MaxHeat Deep-Heat Therapy heat pad generates moist heat which can be easily delivered through the special moisture absorbing cover. 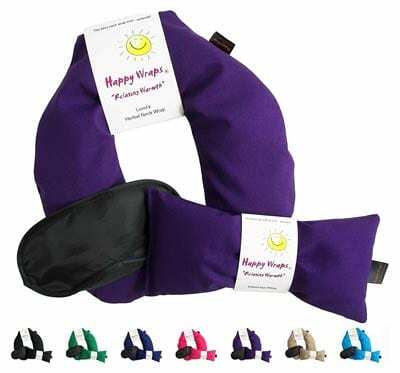 For neck pain and stress relief, we like the Happy Wraps Herbal Neck Wrap due to the low price tag and luxurious material that gives your neck a little hug whilst you carry on with daily life. The price also includes a free eye pillow and sleep mask! 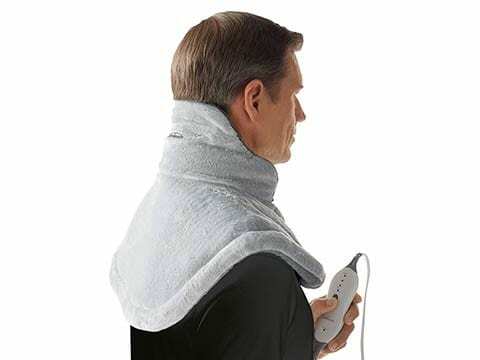 The neck wrap is filled with a blend of herbs and organic flax seeds, which can be heated in the microwave or chilled in the freezer if you want cold therapy. Some users felt the heat doesn’t last long enough, however with just 1 minute in the microwave it can be reheated quickly and many commented how wonderful it smells! If you’re looking for a large heat pad to cover a wide area rather than a small, localised area of pain, then we like the Sunbeam King Size XpressHeat Heating Pad. It comes with 6 different heat settings and promises to be hot within 30 seconds of powering up. 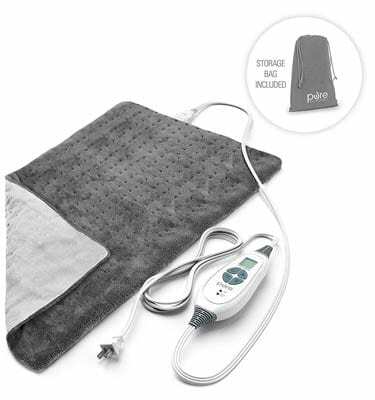 The Sunbeam King Size XpressHeat Heating Pad is reasonably priced and with an adjustable auto-off feature it allows you to tailor the length of your therapy between 2 hours and a continuous on. Plus the heat pad is super soft due to an integrated microplush cover! Reviewers rave about the heat the pad can reach, and use them on a daily basis, so much so that some have found that the product can have a short shelf life. Luckily the company seem to be great at dealing with any technical issues to get your heat pad back in action. 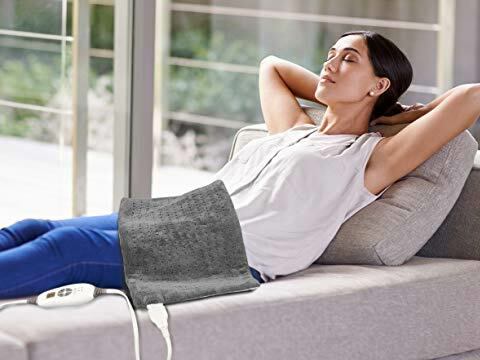 It may seem like a little thing, but many users also commented on the length of the power cord being a selling point, so if you want a heat pad that reaches your favourite comfortable chair, then this is a really good, affordable choice. We love the design of the PureRelief Neck and Shoulder Heating Pad, which is contoured to drape around your neck and shoulders comfortably. It heats up quickly, providing fast pain relief to sore and aching muscles. The LED controller provides four different heat options from warm to high based on the level of comfort that you require, and has a contemporary design making it ideal to wear in the office. 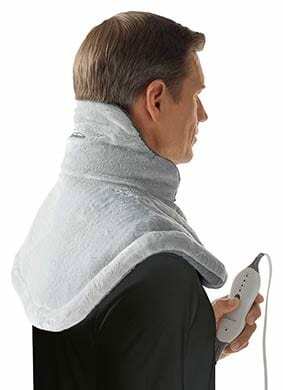 Some users felt that the Neck and Shoulder Heating Pad doesn’t heat evenly, however the level of heat provided satisfied many, especially those suffering from whiplash. We love the handy Velcro straps on the Sunbeam Body-Shaped Heating Pad with Hot and Cold Pack which means you can use the pad almost anywhere on your body. It can be wrapped around your shoulders for neck pain, worn around the thigh to tackle muscle tightness or on your lower back for instant relief. The versatility of the pad means it’s a great tool to have around for dealing with all types of daily pain. You can even comfortably wear the pad on the go! Sunbeam’s Body-Shaped Pad comes with both hot and cold gel packs so you can tailor your treatment, plus the controller has a long cord so you can attach your pad then get comfortable. There are five different heat settings, plus the unit has an auto shut-off function which is handy if you’re so relaxed that you fall asleep! Those suffering from lower back pain found the pad to be very satisfying, and though there was frustration in the lack of timer settings, it was overlooked for the relief it offered. Many heat pads are not designed for you to lie on them and for some pain that’s exactly what you need, so that’s why we love the UTK Infrared Heat Therapy Healing Jade Mat which can be laid on as well as sat on, and is flexible enough to be wrapped around parts of your body. The infrared heat penetrates deep in to your body, as much as 2 to 3 inches below the skin rather than just heating the surface like electric heat pads. For daily assistance with stress and depression, the pad also delivers negative ions to the skin which are believed to increase your daytime energy levels as well as bring about a sense of calm and relaxation. Another great feature of the mat is the memory function which remembers the heat and timer settings that you are used to, and the settings that you used last time, making it ideal for quick daily use. Some found the control pad a little more complex than other heat pads, however if the memory function is what you’re looking for then it may be worth the compromise. The UTK Infrared Heat Therapy Healing Jade Mat is available in different shapes and sizes, and though a little pricier than other options, many users felt that it was worth the money. There are a number of different types of heat pad available, whether you’re looking for one for a key part of your body, an option for when you’re out and about or a specific heating method to target a certain kind of pain. Across the marketplace there are a variety of heating pads available targeting neck and shoulder pain. These tend to be contoured to your neck and designed to drape around your shoulders or hug your neck. XL Heating Pads are available to help treat back pain when you require full coverage along your spine or across your lower back. Smaller pads are also available if you want to target a key area that is causing you pain. Knee support heat pads are also available if you want to target heat around your knee. Electric heat pads heat the surface of the skin and can reach high temperatures, they don’t require recharging and work when connected to the mains. Infrared heat pad claim to deliver deeper and more penetrated heat than traditional electric heating methods, as they don’t just heat the surface of the skin. Moist heat pads like infrared can penetrate deeper in to the skin and increase tissue elasticity. They are often used when skin dehydration is a concern, so for example for patients with dry or ageing skin. Heat pads that are heated in the microwave, generally filled with wheat and natural remedies such as lavender, are often a more affordable option. 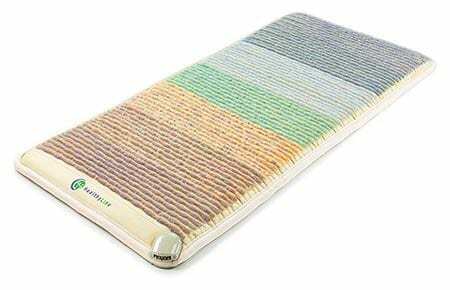 Such as Snappy Heat Pads (link to Amazon listing), which require no charge, you simply snap the metal plate which then generates heat, are ideal for travelling. Normally supplied with a handy storage bag, a travel heat pad can be folded away easily. 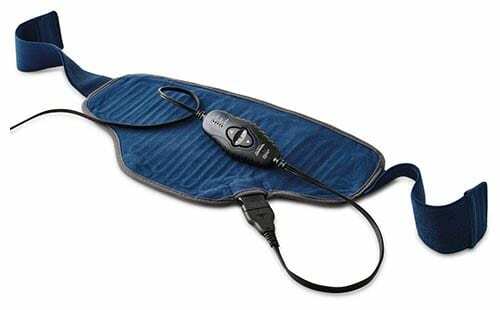 Though not considered a strong option due to the temperatures they reach and the poor quality materials they tend to be made from, USB heating pads offer an alternative to carrying a bulky heat pad with power cord when travelling. Not just for out and about, but also at home if you want to sit somewhere but don’t have access to a plug, a cordless/rechargeable heating plan can offer just the solution. Any product that you use in your home that heats up is obviously a danger if you forget to turn it off, or if you simply fall asleep using it. See what auto shut off function the heat pad offers, if any, and the length of time it will stay on before automatically switching off. Consider as well if a short auto shut off may frustrate you if you’re looking to use a heat pad for a consistent period of time. Different heat pads offer different timer functions, giving you the ability to easily control how long your heat therapy lasts. Depending on the size of the area you want to treat there are a number of different sizes of pads available. Smaller pads for targeted pain relief and larger pads for treating wider areas such as the spine. Each pad will boast a number of different heat settings, so check out the one you want before committing. Memory functions are available on some pads so they can remember the heat settings you use regularly. If you’re looking for a heat pad that you can use quickly in a morning then heat up time may be important to you. There are some that can heat up in seconds and others that will take a little longer. Different fabrics are used on the cover of the heat pad to distribute the heat effectively so it’s worth doing a little research before purchasing. Some heat pads boast about a longer power cord which may not seem a major consideration, however if there’s a location you’ll want to use your pad regularly consider if there’s a plug socket available close by. Again, if a long power cord isn’t going to quite reach or if you want to use your heat pad on the go then a wireless capability could be desirable. Considering the temperature that the pad can reach to ensure that it satisfies you and the level of heat you’re looking for. The method use to heat, whether it’s electric, infrared, microwave or some other form of non-electric heat. Consider what is right for your condition. Studies have shown that heat therapy can give arthritis sufferers some relief from their pain. Particularly with those suffering from arthritis in the hands, heat therapy was found to have short term benefits when used daily. However for certain forms of arthritis it can have a negative effect so it is worth checking with your doctor before you try any form of heat therapy. As fibromyalgia pain isn’t caused by inflammation, heat therapy is the perfect option for symptom relief, helping to relax tender muscles within the body and improve flexibility. Here are a number of different ways you can apply heat to your joints. Heat therapy or heat pads are useful in the treatment of muscle spasms. However professionals advise waiting at least 72 hours after spasms start to allow inflammation to go down. Moist heat is also recommended over dry heat due to the risks of dehydration. The American Cancer Society suggests heat therapy as a non-medical treatment method to help stimulate the skin and offer relief from day to day pain. However it isn’t recommended for those undergoing radiation treatment. The American College of Physicians recommend heat therapy as a treatment for lower back pain as in recent studies it has been shown to offer daily relief from pain. In general terms a heating pad works by heating the surface of the skin which stimulates your sensory receptors, blocking the pain signals that are being sent to the brain. The heat also makes your muscle tissue more elastic which releases tension, increasing your blood flow which brings more nutrients to your painful regions. Are infrared heat pads better than electric heat pads? 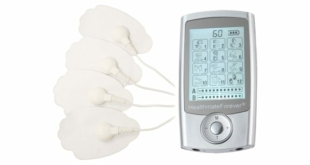 Electric heat pads heat the surface of the skin and do penetrate it to an inch or just over, however infrared pads penetrate it deeper right to the bone and help increase your circulation to encourage your injury to heal faster. It depends on the type of pain you have as to which is most appropriate for you. How hot does a heating pad get? Heating pads vary depending on the style of pad and brand that you go for. However dry heat pads tend to range between 140°F and 160°F with the hottest pads in the range getting up to 175°F. Moist heating pads can reach higher temperatures, up to 180°F, as they are normally used by trained professionals, however there are options you can buy to use in the home. Is a heating pad good for back pain? Yes heating pads are recommended for back pain, however of course you should check with your doctor to see if it’s the right course of treatment for you. Heat therapy can relax the tension in the back that is causing the pain and block the pain signals to the brain, providing partial relief from the discomfort. Is a heating pad good for menstrual cramps? Yes, heating pads are used regularly by those suffering from menstrual cramps, as the heat can help to relax the muscle contractions that cause the cramps providing instant relief. 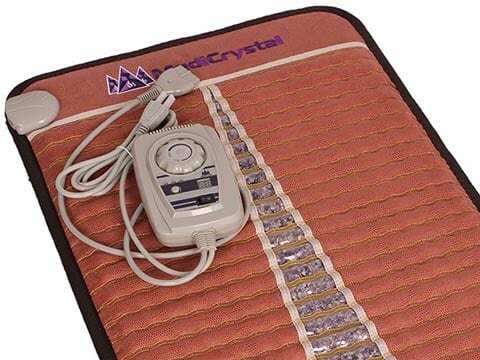 Is a heating pad good for arthritis? Yes and no. For certain forms of arthritis a heat pad is perfect as it relaxes the muscles, particularly for those suffering from arthritis in the hands. However for other forms it can have an inflammatory effect so you should certainly check with your doctor or medical professional before starting any treatment. Is a heating pad good for sciatica? Yes, a heating pad can help relax the muscles that are pressing on the sciatic nerve, offering short term relief from the pain. Are heating pads safe to use during pregnancy? Opinions are quite contradictory when it comes to using a heat pad during pregnancy. In early stages many professionals advise against it, however in the second and third trimesters heat pads that reach a moderate temperature are advised for treatment of pain, as long as they’re only used for a short period of time. To be sure speak to your doctor before trying any form of heat treatment. Will a heat pad reduce swelling? No, Dr Jan Sambrook indicates that a heat pad will not reduce swelling. Where swelling occurs it’s because the muscle tissue is bleeding and by applying heat you’re bringing more blood to the area. How much do heating pads cost? Heating pads vary hugely in cost, from just a few dollars for a disposable heat pad, right up to a high end product that could be as much as $1000. Most heat pads on average, seem to sit around the $50 to $200 mark. Can you sleep on a heating pad? No. Applying heat to your skin for that period of time can cause you to burn your skin, there is also the risk that the heat pad could catch fire, with the CPSC reporting that approximately 8 people die every year from fires caused by heat pads. Where can I buy a heating pad? You will find heating pads for sale online, and are widely available on many websites, such as Walmart, CVS, Target and Walgreens. If you want to buy a heating pad locally, visit your nearest pharmacy. Several online retailers offer free shipping on orders as well. Who is a heat pad not suitable for? From looking at the advice of various manufacturers and professional bodies, below is an example of some conditions and situations where a heating pad is said to not be suitable. However this isn’t a comprehensive list (nor does it constitute medical advice) so it is important to always check with a medical professional before beginning treatment. So heat looks like a great option for many different conditions, and with such a variety of products to select from, what are you waiting for!